By William Mackay: WBC heavyweight champion Vitali Klitschko (45-2, 40 KO’s) is worried bout the injury that he suffered in his win over Dereck Chisora on Saturday night. Vitali was unable to use his left arm for the most part after the 4th. After the fight, Vitali had an MRI done on his left shoulder in Munich, Germany and a small tear was discovered in the tendon above his left shoulder joint. Hopefully, that doesn’t turn out to be the case because sometimes what initially doesn’t appear to need surgery often later does require it when it comes to shoulder injuries. As it is, Vitali is expected to be sidelined for the next 8 weeks healing. After that point, he’ll resume exercising if the shoulder responds to the rest. The shoulder injury to Vitali may help Chisora’s career, because he was able to fight fairly effectively despite losing and he may be able to get get a good fight out of this against one of the top contenders, although it’s unlikely that Vitali’s brother IBF/WBA/WBO heavyweight champion Wladimir Klitschko will show any interest in fighting Chisora. 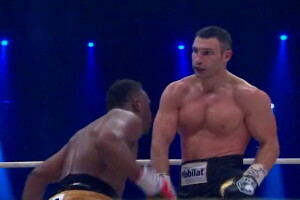 Wladimir was disgusted by Chisora’s behavior in the weeks leading up to the fight, at the weigh-in and during the fight itself. Chisora’s behavior likely closed off any avenues for a fight against Wladimir unless Chisora does something to ensure Wladimir that he won’t act out in the future. Chisora said after the fight last night that he’d like to fight Wladimir. It would be decent fight given how badly Vitali fought against Chisora, and because of the disrespect Chisora showed Wladimir in spitting in his face in the ring last night. « Would a fight between Haye and Chisora go someway to making up for such an ugly mess on boxing?